From the 1920s to 1960s neon signs were all the rage. Cities glowed at night with these bright and often colorful displays. And on long highways, a neon sign was a welcoming beacon of a night’s sleep at an open hotel. Nowadays, signage has spread out to many varieties and the heyday of neon lights is gone. But all great things have their moment to shine again. 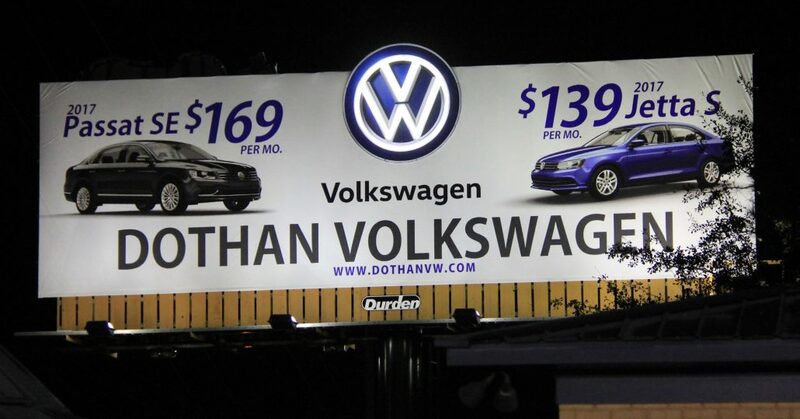 Dothan Volkswagen loved the idea of bringing back this retro look to their outdoor advertising. Although this style may hearken back to the early days of billboards, we reinvented the look for a more modern look befitting the Volkswagen brand. Our team built the neon lighting for the Volkswagen logo from rope light LEDs, doubled to get the full neon light effect. The logo was built all as one unit, so it could be built in-house and added once the board went up. One of the great aspects of adding lighting like this to a board is that in the day, it doesn’t distract from seeing the logo, and at night it stands out from quite a distance. If you need a creative concept to make your business FAMOUS, check out our specials page, give us a ring 334-678-2215 or email at sales@durdenoutdoor.com. The holiday season snuck up on us and is finally here! While you are making your list and checking it twice, it is the perfect time for businesses to plan their marketing to end 2017 with a bang! Holiday spending is expected to increase this year. With more shopping, means more traffic on the road through out the Wiregrass area. 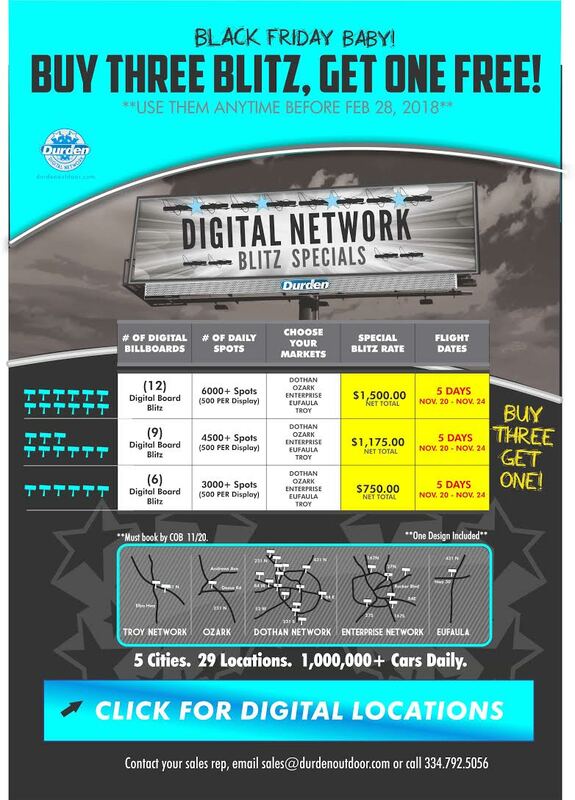 The Durden Digital Network is the perfect way to target shoppers, boasting 29 Digital Billboards located in Dothan, Enterprise, Ozark, Troy and Eufaula. 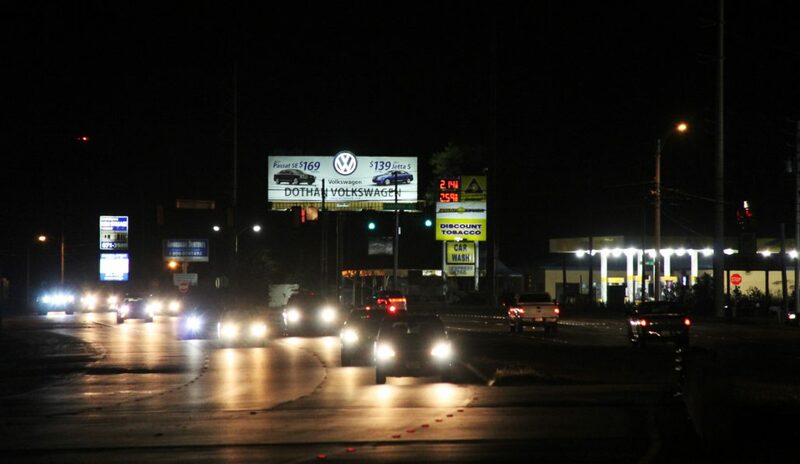 Placing your ad in high traffic areas, along with a call to action message developed by our award-winning creative department, makes for an extremely valuable advertising opportunity. Digital Blitzes are an effective way to concentrate advertising efforts on certain key dates. Durden Outdoor is currently offering Black Friday Digital packages to help businesses with that last minute push. If your business would like to increase their sales during the holiday season, contact one of our FAMOUS Makers today. http://www.durdenoutdoor.com/wp-content/uploads/2016/06/DUR-Footer-Logo.png 0 0 Amy Riddle http://www.durdenoutdoor.com/wp-content/uploads/2016/06/DUR-Footer-Logo.png Amy Riddle2017-11-16 17:46:402017-11-16 17:46:4039 Days Until Christmas!